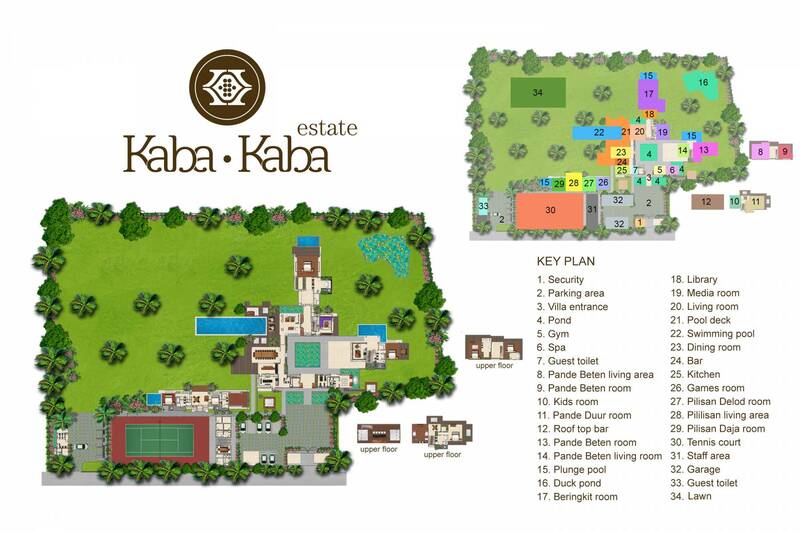 Kaba Kaba is among Bali’s most exclusive villas – a spectacular eight-bedroom estate leisurely spread over more than three acres, staffed by a large professional team, and designed for regal entertaining, multiple family gatherings, and romantic weddings. The villa’s fabulous rural rice terrace setting, panoramic views, private multi-pavilion design, antiques-filled interiors, fascinating art collection and no-expense-spared facilities – including four pools, a tennis court, home theatre, games room, spa and gym – create an unmatched experience for up to 18 guests. Those seeking royal treatment in palatial surroundings will find all this and more at this enchanting eight-bedroom villa. 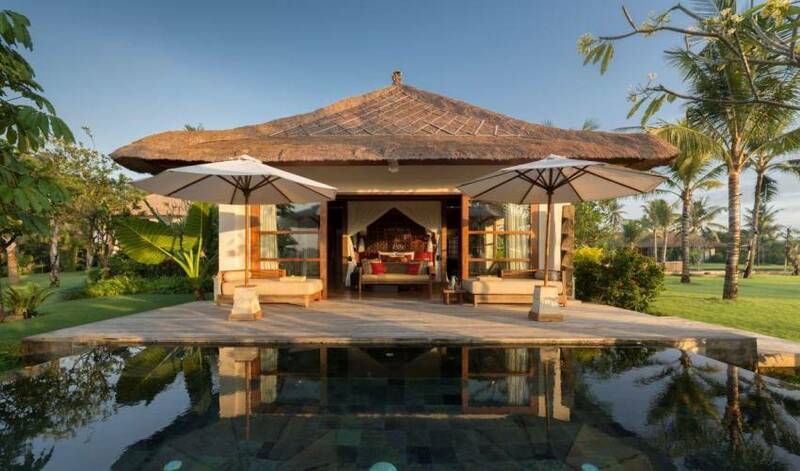 Built on royal land on the edge of Kaba Kaba village in Bali’s Tabanan regency, this stately villa will have guests in its thrall. From the Rajasthan palace elephants guarding the lotus courtyard to the gilded throne from a Burmese temple presiding over the dining pavilion, the stunning interiors are a treasure trove of skillfully curated antiques, curios and paintings that reveal the owners’ passion for Asian culture and contemporary art. The elegant living areas and bedroom suites scattered among the multiple pavilions of this glorious estate enjoy majestic views; beyond manicured lawns dappled with palms, lotus ponds and sparkling swimming pools, an emerald sea of rice terraces rolls towards the Indian Ocean a few kilometres south, and northwards towards Bali’s dramatic volcanic peaks shimmering on the horizon. Closer to home, the villa’s no-expenses-spared facilities command sovereign attention. Hold court at the head of the six-metre-long table set for a feast created by the accomplished chef. 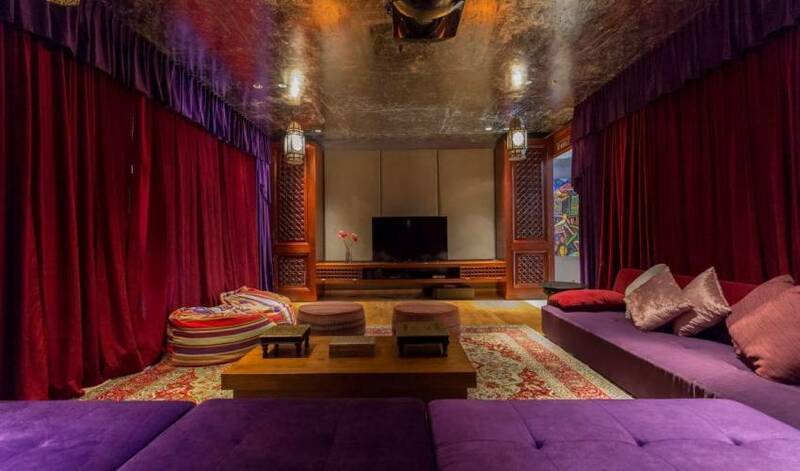 Sink into the deeply cushioned banquettes in the velvet-curtained home cinema. Work out in the gym before deservedly basking in a mandi lulur royal body treatment at the private spa. 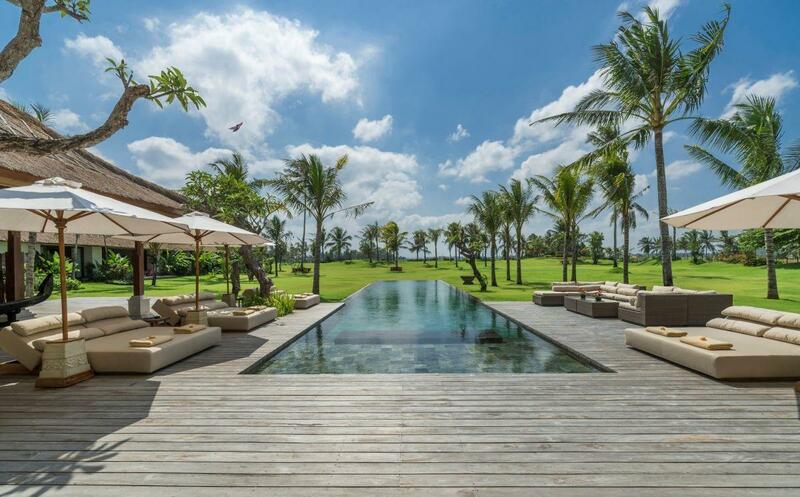 Serve an ace on the pro tennis court, score a goal at table football and take a bike ride through the rice fields. Naturally, these fabulous facilities are accompanied by impeccable service provided by the charming, professionally trained 23-strong staff. Designed for regal entertaining, the villa is a sought-after venue for large family gatherings and special celebrations, and will capture the heart of many a bride and groom seeking a picture-perfect setting for their nuptials. What could be more idyllic than exchanging vows on the lawn, dining by candlelight under the stars, then retiring to the supremely romantic master bedroom suite with private plunge pool for a first night as newly weds? The villa’s eight bedrooms and numerous living spaces are distributed among a series of pavilions fanning out from a central courtyard and oriented to a panorama of emerald rice terraces. First is the entrance pavilion, which houses the spa, gym, and above, a rooftop bar, balé and performance space. On the ground floor of the main pavilion a foyer leads to the formal living room, the media room, the library and the master bedroom suite. Upstairs are two guest bedrooms. Next is the open-sided dining pavilion with guest kitchen and service kitchen tucked behind. To one side of the rolling lawn is the single-storey Pilisan Pavilion housing the games room and two guest suites separated by a living area, with the tennis court behind. 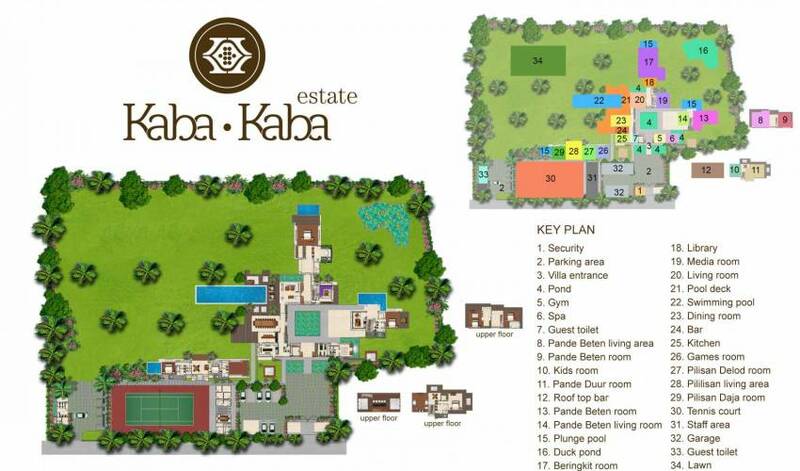 On the other side is the two-storey Pande pavilion with its open living area and three guest suites. 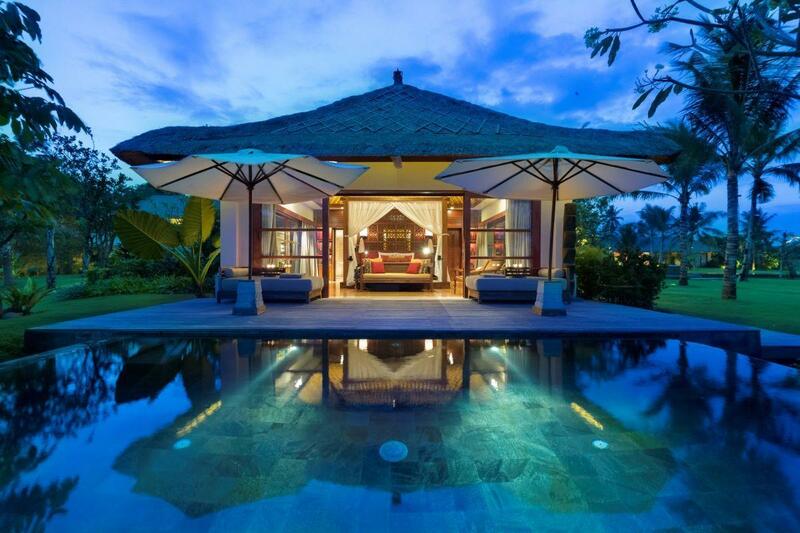 The villa has an abundance of living areas spread throughout its grounds – some large enough to easily accommodate a full house of 18, some set back in private corners for those seeking a quiet retreat from the crowd. A formal living room rests at the heart of the estate’s main building. Conversation flows in this elegant space with generous seating, gilded Burmese and Thai Buddhas displayed against a silk-lined wall, and spectacular 180-degree views beyond the pool and garden. Sliding glass doors on two sides can be closed for air-conditioned cool, or left open for fan-assisted tropical living. Two more living rooms complement the guest pavilions. Designer fiberglass bulldogs guard the entrance to the Pilisan living area with its Andrew Martin ikat-covered seating, colourful kilim and garden deck. The open-sided Pande living area exudes Raffles-style elegance with its diamond-patterned marble floor, colonial-style cane seating, steamer trunks, whirring paddle fans and crisp white colour scheme splashed with blue accents from Chinese ceramics. The TV is discreetly hidden behind sliding doors, and pride of place is given to the stately table with an 18th-century marble top from a Rajasthan palace. A solid Suarwood table – so heavy it took 40 people to install – stretches over six metres and is surrounded by 18 upholstered dining chairs, commanding centre stage in the open-sided dining pavilion. 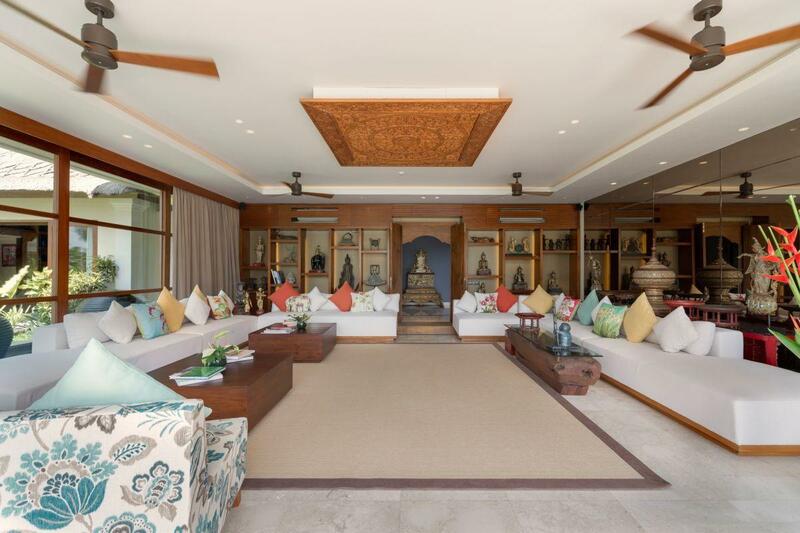 Among the eclectic collection of Asian antiques that adorns this space is the gilded throne from a Burmese temple and an Indian Kerala river boat. Alongside is a gleaming open-plan guest kitchen with sit-up bar, coffee machine and TV and, behind a wall of gold lacquer hiding two wine fridges, the main service kitchen contains an enviable range of quality culinary equipment. 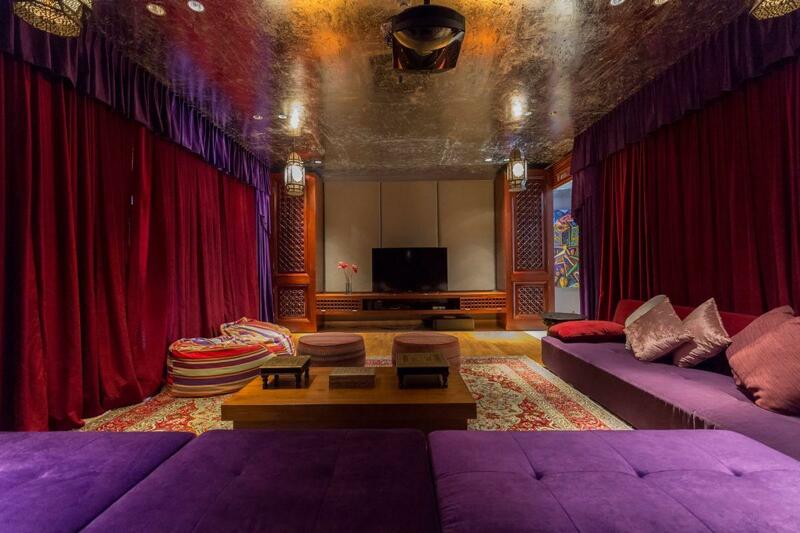 In this Moroccan-themed media room, curtains of rich maroon velvet frame plush sofas set on a Persian carpet and facing the 60-inch TV with Bose surround-sound. For an enhanced cinematic experience, movies can also be enjoyed on the huge retractable projector screen. In an adjacent washroom, where bevelled mirrors hang on metallic walls, the decadent souk-style continues. Kids of all ages will love playing air hockey and table football in the games room, which has a long bench with bar chairs designed for gaming (bring your laptop), a walk-in play room full of toys, books and board games, and a cute washroom. The library adjacent to the master bedroom suite is the perfect spot for some quiet time in the company of an absorbing book. The shelves yield an intriguing selection, from popular fiction to photography-rich books on Bali; take your pick, then curl up on the canopied seat hand-printed with an antique map of the East Indies. 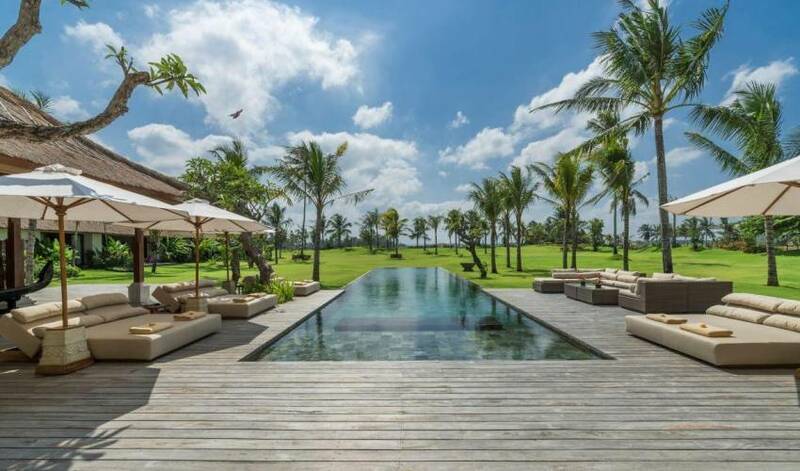 On the upper level of the entrance pavilion is a huge entertainment space, with alfresco performance area, covered bar, and enormous rooftop balé where guests can enjoy Bali’s legendary sunsets sprawled in cushioned comfort. Around the main 25-metre swimming pool are deeply cushioned sunbeds-for-two and all-weather rattan seating arranged in a convivial u-shape. The bedrooms’ balconies and decks provide many private areas for quiet relaxation too. 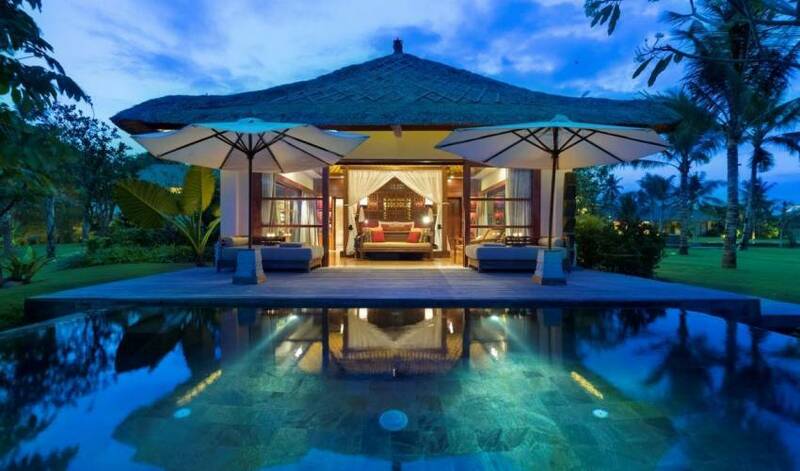 The villa offers seven bedroom suites – five with king-size beds and two with twin beds convertible to kings – each oriented for privacy with garden and rice-terrace views. An eighth room, with two sets of bunk beds, is designed specifically for kids. Named after the major banjars (community councils) in the village, these large suites have marble-edged teakwood parquet floors spread out under a vaulted alang-alang thatched roof. Stunning antiques, contemporary paintings, hand-crafted ikat fabrics and statement furniture create a truly princely experience. 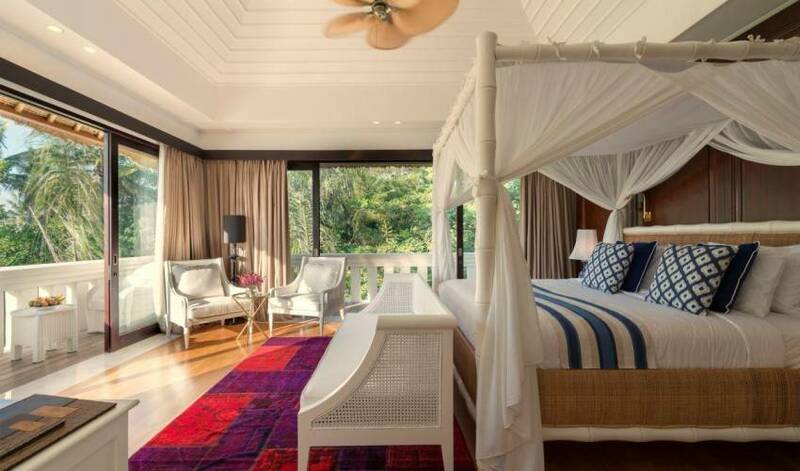 Four-poster beds with King Koil Pillow-top mattresses dressed in high-thread-count bed linen ensure a sublime night’s sleep, helped by blackout curtains and a choice of air-conditioning or overhead fan. All suites have 32-inch TVs and Blu-ray players with iPod docks and speaker systems, dressing rooms and ensuite bathrooms with statement bathtub. The bedrooms and dressing rooms feature both air-conditioning and dehumidifiers, and bathrooms are also air-conditioned. From the library in the villa’s main pavilion, a corridor lined with children’s paintings leads to the palatial master suite with its huge pillared bed on a raised platform. The large bathroom attached to this magnificent suite includes a private garden with alfresco shower and regal hamam-style sunken bath. 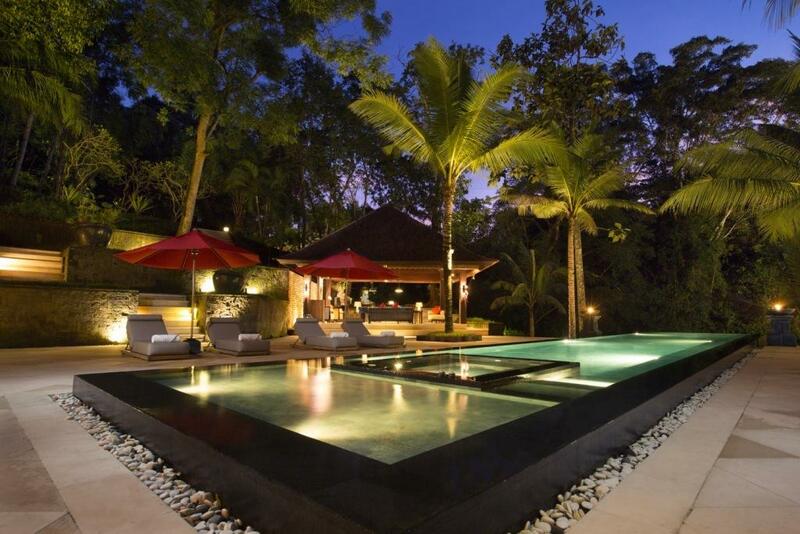 Outside is a private sundeck and 6m x 3m plunge pool bordering the rice terraces. Upstairs in the main pavilion, the super-sized Juntal Daja suite is warm and inviting with Chinese-red walls, a richly coloured oriental carpet, and stunning black & white prints by Bealana Cho. A sitting area extends beyond sliding glass doors onto a large terrace where rice-field views can be enjoyed from a double daybed. Across the breezy hallway is the twin-bedded Juntal Delod suite with a balcony wrapping two sides. 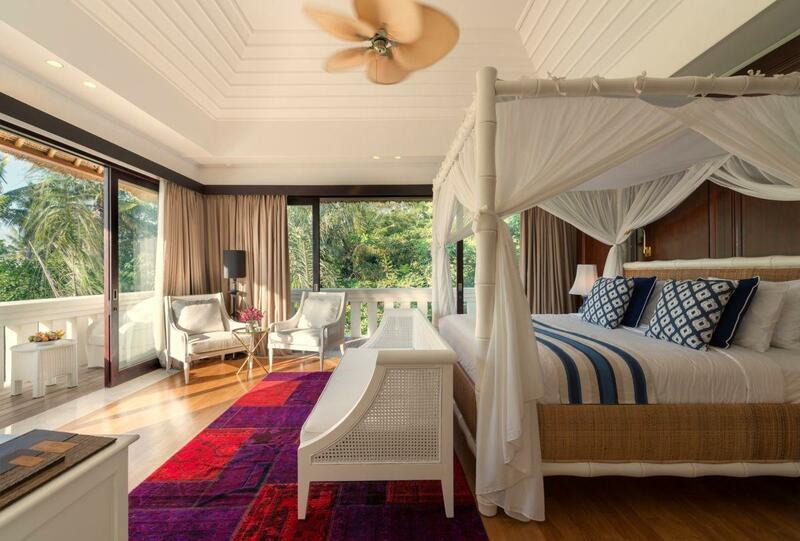 A private ironwood deck with circular loveseats overlooking a mature Kapok tree is the focus of the spacious colonial-styled Pande Betensuite. Within the Venetian-mirrored, marble bathroom, sliding shuttered windows by the bathtub give the option of a long soak-with-a-view, as an alternative to the garden shower. Above, the Pande Duur suite has the same expansive layout, with a stunning red-and-purple rug offsetting stylish white-painted furniture. This suite also has a bathtub-with-a-view, plus an ironwood balcony on two sides. Also on the second level is the kids’ room, Pande Alit, with two sets of bunk beds, beanbags, lots of toys and a fun, colourfully tiled shower room. The 12m x 2m wading pool lies just outside this pavilion. Both suites in the Pilisan pavilion feature walls of carved teakwood and beds facing the garden beyond sliding glass doors. The Pilisan Daja suite has its own plunge pool just two steps from its stately four-poster bed, and louvred windows opening onto the bathtub in the indoor/outdoor bathroom. The Pilisan Delod suite is furnished with twin beds that can be configured as a king, and has both indoor and outdoor showers in its bathroom.